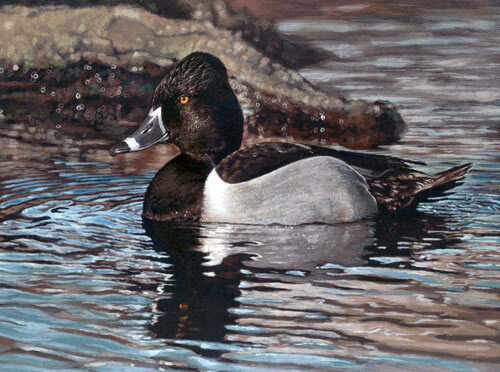 Simply Stunning Juinor Duck Stamp Entries! This Friday my naturalist duties take me down to the Science Museum of Minnesota for the 2010 Junior Duck Stamp Competition. The judging ceremony will begin at 10 a.m. and is open to the public at no cost. If you can't make it to the event be sure to check out the top picks from each state online. The competition is open to kids in grades K-12. Sales of duck stamps raises 25 million dollars a year to fund wetland habitat acquisition for the National Wildlife Refuge System. I am completely blown away by the talent displayed by the kids this year. All of the states put in a good showing and it will be hard to select the finalist. 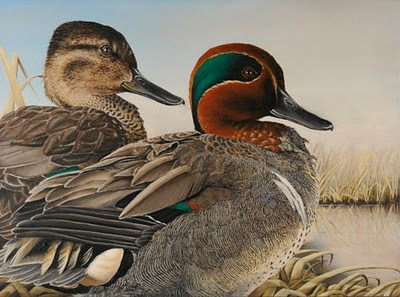 The adult winner has already been chosen and I have to say there are a number of entries in the Junior Duck Stamp competition that at least to my eyes are superior to the winning adult entry. Granted, I don't have access to the originals, only digital versions but they are stunning none the less. Here are my top two picks. I can't decide on a top entry until I can see them in the flesh on Friday. First off is the Ohio entry. The names of the kids have been withheld to keep the judging fair so I can't properly credit the image at this time. Take a look. This is wonderful work and shows incredible talent. 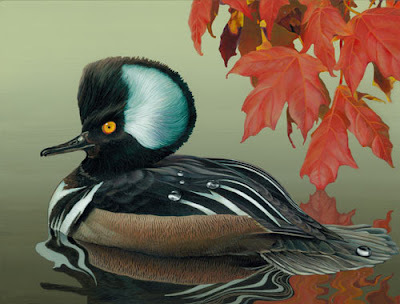 It is a masterful depiction of a Hooded Merganser but it is more than that. It has character and a developed artistic style. I feel like I could pick this artist's work out of a crowd because of that style. My second top pick is from that hotbed of east coast birding, New Jersey. The New Jersey entry is simply stunning in that it looks so incredibly real. It looks just like a photograph. Every person I have shown it to has said, "Oh come on, that's a photo." I can't say enough good about this one either. Everything is perfect. I don't envy the judges on Friday. There are so many good entries. I'd be remiss if I didn't plug our local artist here as well. I think Minnesota is putting in a great entry this year. Here's the winner from the statewide Minnesota competition. Very nice work. It will be exciting to see who wins. While all of the entries are great. I'd say there are about 10 states in the running for the top spot. For what it's worth, here are my top ten picks in alphabetical order. Georgia, Illinois, Louisiana, Minnesota, Mississippi, Montana, New Jersey, Ohio, Oregon, West Virginia. Go look at them for yourself and let me know if you agree. Be sure to come to the event on Friday or check back to see who wins.